​Thomas L. Moore, Jr. has been the General Sessions Judge of Weakley County, Tennessee since 1990. Prior to his election to that position he was an attorney in Weakley County with offices in Martin and Dresden, with the firms: Brundige & Maloan; Brundige, Maloan, Gallien & Moore; and Maloan, Gallien, Thomas & Moore, from 1979 till 1990. 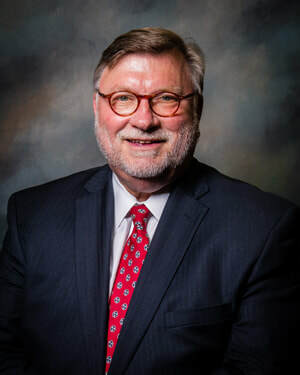 He received his undergraduate degree at the University of Tennessee, Martin in 1976 and his Juris Doctor degree from the University of Memphis, Cecil C. Humphrey School of Law in December 1978. ​He is married to the former Carol Reavis of Dresden. They have two children. Their son, Joshua Thomas Moore is married to the former Bonnie Brundige. They have a daughter, Marianne Moore. Their daughter, Kate Leeann Moore is married to Alex Bynum. They have a daughter, Roane Bynum. He is married to the former Carol Reavis of Dresden. They have two children. Their son, Joshua Thomas Moore is married to the former Bonnie Brundige. They have a daughter and son, Marianne and Eli Moore. Their daughter, Kate Leeann Moore is married to Alex Bynum. They have a daughter, Roane Bynum. Professionally, Judge Moore is a member of the Weakley County Bar Association, Tennessee Bar Association, American Bar Association, Tennessee General Sessions Judges' Conference, the Bar of the United States Supreme Court and is a fellow of the Tennessee Bar Foundation. He has twice served as the president of the Tennessee General Sessions Judges Conference and was a member of the State Judicial Council. He served on the State of Tennessee Private Probation Commission and other state committees for the betterment of the State Judiciary, including: the Implementation Committee on Racial and Gender Fairness in Tennessee Courts; the TGSJC committee on the Future of the Courts; the Judicial Council Committees studying Uniform Court Costs and Municipal Courts; and the Judicial Ethics Committee appointed by the State Supreme Court. He has completed several courses in judicial education at the National Judicial College at the University of Nevada. Judge Moore is a member of the 27th Judicial District Recovery Court Team. He is the associate Judge, sharing the judicial role on that team, with presiding Circuit Judge Jeff Parham and Generals Sessions Judge of Obion County, Jimmy Smith. Locally Judge Moore serves as: the former Chairman of the Weakley County Prevention Coalition; as a past member of the Weakley County Domestic Violence Advisory Committee; past member and past chairman of the Weakley County Foster Care Review Board; President of the Weakley County Affiliate Habitat for Humanity; member, past President, Director and Paul Harris Fellow in the Dresden Rotary Club; Trustee of the Weakley County Baptist Association; President and member of the Dresden Foundation; member of the Character Education Committee of the Weakley County School Board; member of the Board of Directors of the Sunset Cemetery Association; Secretary and Director of the Dresden Senior Community, Inc; Captain of the Dresden Volunteer Fire Department; City Judge of the cities of Dresden and Gleason; Chairman of the City of Dresden Planning Commission; member of the Obion River Regional Library Board; and sings with the David Johnson Chorus, the Goodtime Singers Gospel Quartet and the Tennessee Baptist Men’s Chorale. Regionally Judge Moore served for several years on the Board of Trustees of Union University in Jackson, TN. He has served on the Executive Board at that Institution and was a member of the Presidential Search Committee in 1994. Judge Moore has taught as an adjunct professor in the Political Science Department at the University of Tennessee at Martin and is currently a member of the planning committee for the annual, nationally recognized and honored, Civil Rights Conference at that institution. ​Judge Moore is also local businessman. He is a stockholder in Thunderbolt Broadcasting, Inc. and Kentucky Bell, Inc. He was a past stockholder in Gibson County Broadcasting, Inc. At one time he was a partner in a local real estate investment company that built and operated the Dresden and Huntingdon Dairy Queens, the Weakley County Lumber Co, Inc. and the Heritage Shopping Center. He and his wife, Carol and her family are partners in one of the oldest family owned and operated businesses in Weakley County, E.T. Reavis & Sons. Judge Moore resides in Dresden, TN. He is a member of the Dresden First Baptist Church, where he serves as a Deacon, Sunday School Superintendent, trustee, church pianist, choir member and Sunday School Teacher. He has accompanied the Senior High and College youth at Dresden First Baptist Church on 12 summer, week long, mission trips to various locations within the United States as a part of the North American Mission Board of the Southern Baptist Convention World Changers projects, performing rehab construction on the homes of underprivileged individuals in remote poverty stricken areas and inner city slums. He has joined with both Union University Medical Mission teams and the Weakley County Baptist Association construction teams to carry on short-term mission projects to Honduras, Central America on 17 trips. Moore has also been involved with the Weakley County Baptist Association on several short term mission trips to West Virginia and the Cincinnati, Ohio area.